The Barrister Brief: How Do I Make An Aboriginal Rights Claim in Court? How Do I Make An Aboriginal Rights Claim in Court? 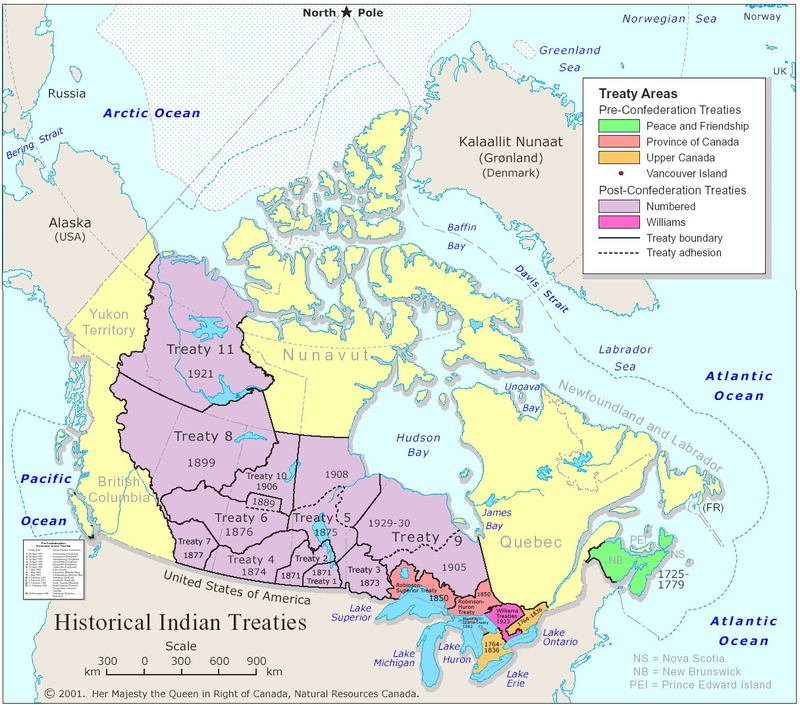 It's now undisputed that Canadian Aboriginal peoples have rights. But if you're a member of one of those peoples, you might be wondering: "How do I claim my rights?" You might be asking yourself questions like: "If I'm in court being criminally prosecuted or civilly sued, how do I invoke my rights?" If you see environmental destruction being visited on your traditional territory by private interests, or witness the destruction of your community's way of life by government interests, you might wonder: "how can I use my rights in court to stop this destruction?" The short answer is that you can accomplish a lot through relying on your rights in court, but you need to understand their limitations, and that the burden of proof falls entirely on you in court to prove those rights. Limitation #1: Aboriginal rights are collective rights exercisable by individuals. What this means to you is that you need the backing of your community to assert rights in court, and you need to be able to prove that you're a member of that community. There's no precise test of what an Aboriginal community amounts to for the purpose of a rights claim, or what being a member of the community requires - this is NOT a question of being on some Indian Act band list (though that can help). But you can't be out acting on your own without at least tacit or implicit community support if you expect to invoke Aboriginal rights in support of your actions. Limitation #2: You need to be clear on whether you are advancing an Aboriginal title claim, Aboriginal treaty rights claim, or non-treaty Aboriginal rights claim. Unless you have the backing of your whole nation, and millions of dollars to spend on the litigation, don't bother with title - the courts have been clear that title exists, but don't seem to want to award it to anyone even after trials that have lasted for years! 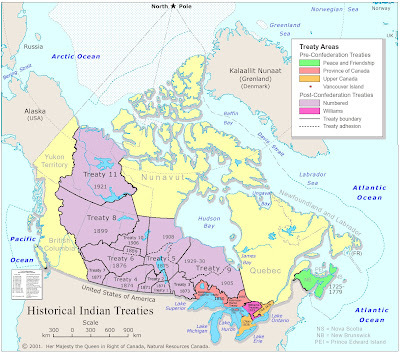 If your community is connected to a treaty - historic like those on the map above, or modern like those on the map below - carefully comb through its language to see if there is something in there which might help you. If your community doesn't have a treaty, or if the treaty isn't of any help in your particular situation, then you are left with a straight forward Aboriginal rights claim. Limitation #3: You'll need lots of evidence to support your claim. You can't just make a bald claim of a right, and presume the court will accept it. In fact, the Crown might call evidence to rebut anything you do present, so make sure your evidence is relevant, compelling and voluminous. You might need an expert witness historian or anthropologist. If this sounds a bit much, remember that you're playing by the rules of court, not necessarily the rules of common sense. The most important thing you can do to make an Aboriginal rights claim work in court for you is to claim only the narrowest right which is still broad enough to assist you in your case. The broader the rights claim, the more evidence you will need, and the more nervous the court will get that granting you your claim might lead to an unpredictable domino effect throughout Canada among other Aboriginal peoples. You'd be quite right in thinking this wouldn't be such a bad thing, but remember that courts are by nature conservative institutions that worry about rocking the boat of state. You also really need a lawyer to make an Aboriginal rights claim work in court. There's certainly some legal work people can do for themselves, but Aboriginal rights claims can only be described as complicated and challenging to advance, even for the lawyers who are familiar with those types of cases. But you shouldn't necessarily expect to pay for all those legal costs out of your own personal pocket - these claims mainly work when a community is willing to support their costs (because there will ultimately be a benefit to the whole community), when the government agrees to provide test case funding, or the government is ordered to provide funding by a court. Copyright 2015 G. S. Campbell. No legal advice is being provided. Please retain a lawyer for advice. Simple theme. Powered by Blogger.